There are many types of unusual wedding bands. If you love a traditional look, an antique band might be perfect while someone who prefers contemporary style would possibly gravitate toward tension set bands. Whatever your taste, there is a perfect style for you. Absolute Titanium has some magnificent black titanium wedding bands with colored tension set stones. They are breathtaking. Tension set rings from Heavenly Treasures include an angle cut design. 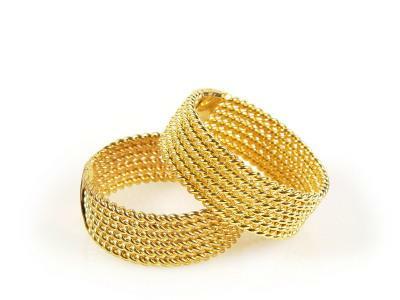 Hand woven bands from Todd Allen Studio are one of a kind rings for the most unusual wedding bands ever. To create these intricate bands Todd heats the gold, silver, or platinum and pulls it through a series of different molds to get the exact size and shape he wants the gold to be for each band. Each ring is made by hand, one at a time in intricate detail.Todd has been twisting these metals into beautiful braided bands and other jewelry for over twenty years and the results are spectacular. The rings are very durable and made to last a lifetime. One of the most interesting facts about these rings is that the artist can weave a long, continuous braid and make both of the wedding rings from the same braid. You can have a unique band with a beautiful symbolism that just can't be beat. Are you an eco-conscious consumer? Wooden bands are not only beautiful they are a great alternative to the cost and controversy of traditional wedding bands. The rings can be refinished if they begin to show wear. Using a wood balm on them is recommended to keep the wood in good condition. One of the negatives of a wood ring is that most people gain weight over time and the wood rings have to be completely remade, they cannot be sized once they are completed. Generally most artisans of these rings are environmentally responsible and get their wood from deadwood; wood that has all ready fallen to the ground and is hand gathered. The glues used are safe and non-toxic. Touchwood Rings uses a completely vegan glue. If you like the idea and the look of wood but want the durability and ease of metal then browse the Mokume Gallery. Mokume bands are made in gold, silver, platinum and other metals but have a wood grain effect from an ancient Japanese lamination technique. Simply Wood Rings has some gorgeous designs. Some include inset stones, like turquoise, or insets of silver for truly unusual wedding bands. Touchwood Rings Gallery has a glossary of the meanings of the different woods that they use. These beautiful bands are inlaid with various types of wood, and other items. In particular, look at this black wood ring that was inlaid with crushed lapis. Unique wedding rings set you apart from everyone else. They can symbolize a certain aspect of what makes your relationship special, be engraved with a symbolic verse, or just be eye-catching and unusual. Some of the more unique bands have unique care needs that you will want to know about before you buy. Ask plenty of questions and make sure they are answered to your satisfaction before you buy. Most of the time you will be working with small-volume artisans and you will have more of a relationship with them than if you order from a very large company. Keep this in mind when considering the price of the ring. You will be paying for the uniqueness of the ring as well as the time it takes the artist to painstakingly craft it.